You may find yourself in a situation today that you need to come out fighting to protect yourself and those around you. If this is the case then make sure you have a game plan in place because the opposition looks as if they are not taking any heed of your words or actions. If there is a situation building up in your workplace that looks as if it may blow up you need to take several steps back and watch from the side lines. Do not get embroiled within the game that is being played out here as it looks suspiciously like bullying and the more power you give to this bullying the more the bully will benefit from it. You may wish to look at what rights you do have because even though you look like the “under dog” (or “under fox”) in this situation you have other avenues to explore and those avenues will need to be you keeping a clear head while you ascertain what legal rights you could use to get this bully off your back. If you look at the image in this card you will see that you are perhaps trying to protect others with your behaviour or that you are trying to protect what you have earned whether this be your reputation or your position you will not back down and just hand it over without a fight. There is also the position you hold within the image and it looks as if you are the one whose territory is being encroached on. The other person though is quite pushy, aggressive and will not back down so for your own sake and the sake of those around you a new game plan needs to be hatched so that you are seen as the person in the right so that nothing can be misconstrued or used against you. Be a crafty fox… don’t play the bully’s game… play your own. A game they will not see coming. 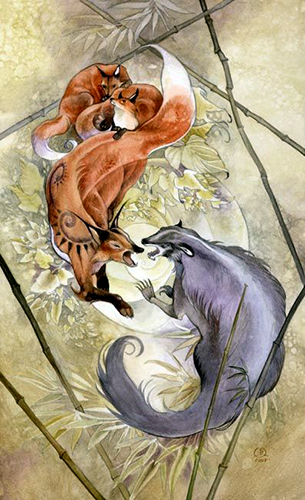 The card used for today’s tarotscope — Seven of Wands — is part of the Shadowscapes Tarot series by Stephanie Pui-Mun Law and Barbara Moore, and can be purchased directly from the Shadowscapes website or through its publisher, Llewellyn. This deck can also be downloaded as an app for Android, Ipad and Iphone devices through the Fools Dog website. Please also “like” this deck’s Facebook Fan Page!